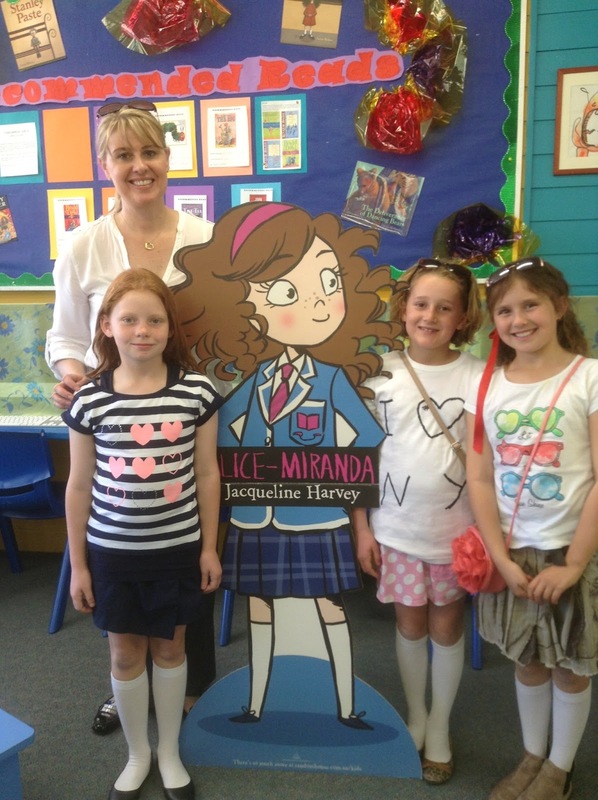 Jacqueline Harvey is a bestselling children's book author from Sydney Australia. I started this blog to document an extended trip to the US and UK in 2012, introducing children to my Alice-Miranda series. It's hard to believe that it's just on four years since we launched the first Alice-Miranda title - and now there are nine books out in Australia with another five still to come. 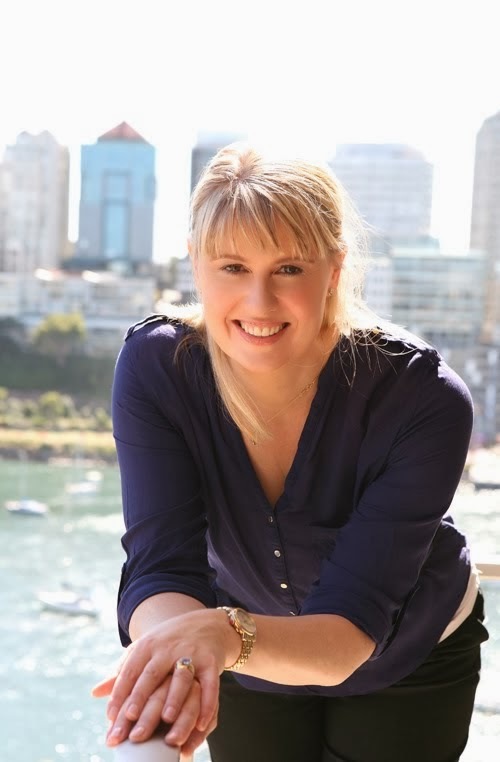 When I first came up with the idea of this precocious seven and a quarter year old, I had no clue that she would take me on such an amazing journey, not only in Australia but also across the world. I visited 37 schools while we were away in 2012 and gave over 80 talks - it was fantastic. In 2013 I've been on lots of new adventures in the UK - visiting schools from London to Southampton, Lancashire, Scotland, Newcastle and back to London again. After that I headed off to meet readers in Singapore. In Australia I've been to Melbourne, Perth, Albany, Alice Springs and Brisbane. There's a new series too - about a gorgeous little girl called Clementine Rose. She and Alice-Miranda don't know each other yet, but they will soon. What a week! Alice Springs was fabulous with amazing hospitality from our hosts and tour guides Celia Otley and Ruth Jones. Both ladies are former librarians and have been dedicated members of the NT CBCA (with President and Secretary roles to name but a couple of the many jobs they have done over the years). Ruth was the brainchild behind the Alice Springs Children's Literature Festivals, of which they have now had three and Celia took over the reins of the last festival. Tuesday morning, Ruth picked me and we headed across town to Living Waters Lutheran School, which we'd passed on our West MacDonnell Ranges tour the day before. It's a beautiful school and the children were fantastic. Their facilities are excellent too and the whole school has a lovely warmth about it. The librarian, Kate was from Shrewsbury in Shropshire, England and then she'd lived in Preston in Lancashire (where Ian and I had visited during our trip to the UK in February and where we are heading back to in November). That was a lovely coincidence. Her daughter Scarlett is an avid Alice-Miranda fan and it was great to meet her too. Our second school of the day saw us cross town (Ruth was hoping not to encounter any trains - as apparently they take about 7 minutes to run through). I would have loved to see the Ghan while we were out there but it was not to be. School number two was Ross Park Primary where I was greeted by three little girls dressed as Alice-Miranda, Millie and Jacinta! I was so overwhelmed - they were absolutely gorgeous. Ruth and Celia swapped over chaperoning duties and Celia then took me to lunch at the Bean Tree Café in the Olive Pink Botanic Gardens. Lunch which was delicious and highly recommended. Olive Pink was a remarkable woman who campaigned for the rights of Indigenous people at a time when this would have caused considerable eyebrow raising - she also lobbied to have a garden in Alice Springs dedicated to arid zone plants. Ruth joined us again and we headed into town to visit Bev, the owner of the very beautiful Dymocks store and meet up with my mother in law Joan, who had been on the hop on, hop off bus, visiting various sites around town that morning. We found her in the shop along with a lovely display of Alice-Miranda and Clementine Rose books. On Tuesday evening Joan and I walked down to the Juicy Rump restaurant at the hotel where we were staying and were surprised by how busy it was - then we realised that it was half price Tuesday and it seemed like half of Alice Springs had come out to get a steak! We met a gorgeous couple from a property a long way north of Longreach in Queensland. They had flown into Alice Springs on their way to Broome. Joan was particularly fascinated that they were flying their own little Cessna all the way across the country. We had dinner with them and heard all about their life in the bush. 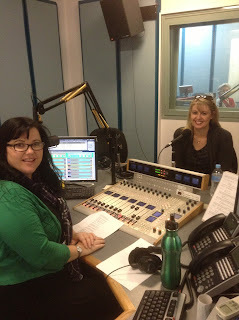 Wednesday morning saw us visiting ABC Alice Springs for an interview with the lovely Nadine. It was great fun to talk to her and I hope that I can get a copy of the podcast at some stage. 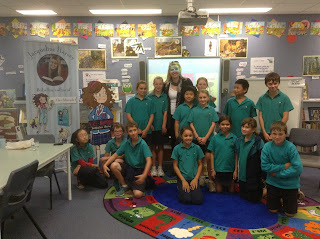 We then made our way to Our Lady Of Sacred Heart in town where I talked to the Year 1-2 students, then Year 3-4. There are three campuses for the school which goes from Kindergarten to Year 12. It was great to meet the kids and the school was very welcoming. 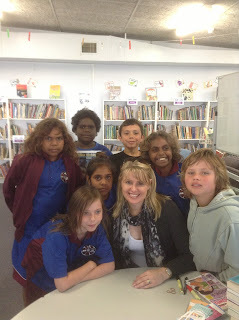 It was then over to Yipirinya Indigenous School on the other side of town. The Headmaster, Ken Langford-Smith greeted us warmly and we had lunch in the dining room with Margaret Kemarre James, the author of the Honey Ant Readers. It was great to talk to her about her work developing these readers, which have now been produced in six Indigenous languages. As it happened Margaret was on the same flight to Sydney as Joan and I on Friday and it was good to talk to her a little more about her work. Lunch was a delicious tuna pasta bake. All of the children are given breakfast and lunch each day and are bussed in from the various town camps. I worked with one of the Year 3-4 classes. The school caters to some of the most underprivileged children in the town. I talked to the kids about where I came from and who my family was and showed lots of pictures. 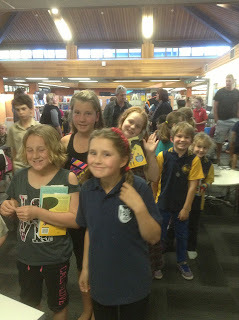 I also told them some stories and asked them lots of questions. I got a lot of cuddles too. In the evening we were treated to a wonderful dinner at Ruth and Bob's place, a short drive from town. It was great to meet the dedicated members of the local CBCA and some friends of Ruth and Bob's too. Dinner was delicious. On Thursday morning we headed to Bradshaw Primary School where I spent time with the Year 3-4 students, then the Year 5-6's. Again, another group of interested kids with lots of great questions. It was good to see the teachers enjoying themselves too. Sadadeen Primary School came next. It has a relatively small student population of just over 100 kids and is 85% Indigenous. 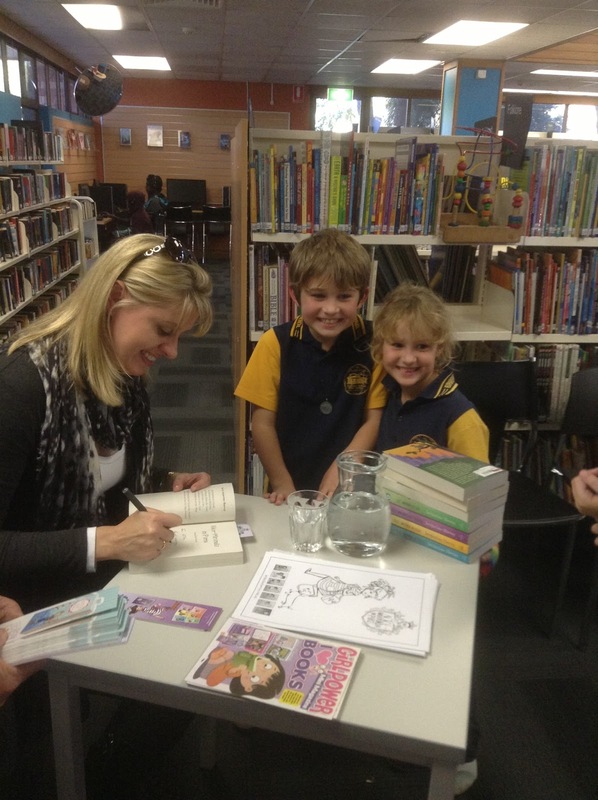 The librarian Ailsa was so enthusiastic and had really prepared the children well for the visit. 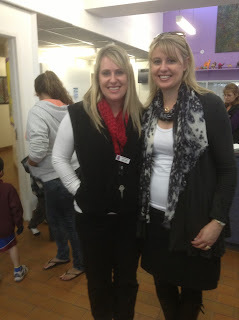 It was great to meet so many staff too, including one of the teachers that the children thought was my double. Apparently when the posters went up around the school, they kept asking her when her sister was coming to town. I could see why they thought we had a resemblance. Our final school for the day was Larapinta, one of the largest schools in town, where Ruth had been founding librarian and where there is a plaque commemorating her work in the library. Current librarian Sue greeted us very warmly and we had a wonderful time meeting the students, some of whom then came to the public library event immediately after school. Sue came along too. It was wonderful to have such great support, so far from home. I was thrilled to see quite a few of the children I'd met earlier in the week at the library as well as students who I hadn't seen but had heard I was in town. 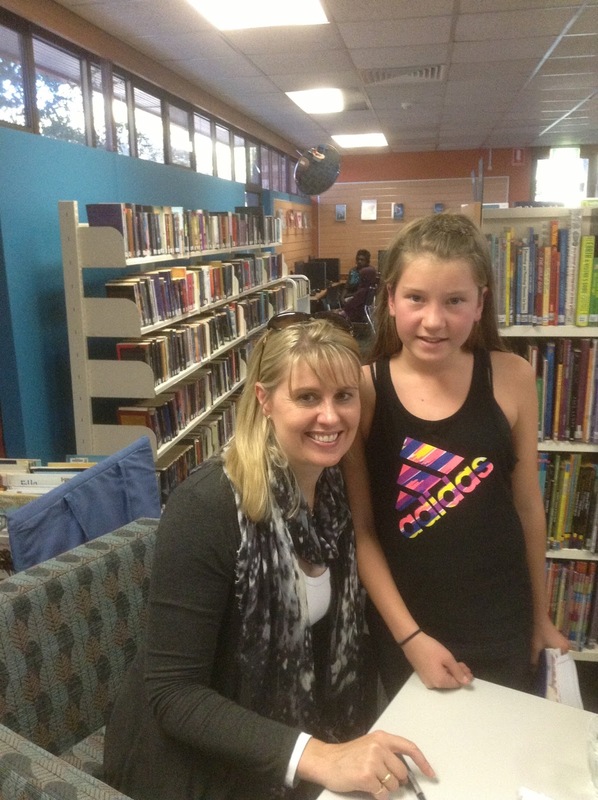 One little girl and her family were from Ceduna in South Australia and were travelling and heard I was going to be there. The little girl was a great fan and it was amazing to be able to meet them in the middle of Australia. Friday came far too quickly. Our final school for the tour was Braitling, one of the larger schools with about 300 students. There is a large number of Indigenous children, many of whom are bussed in from the town camps. The librarian Sara explained that they have a number of initiatives as part of the Northern Territory Intervention and they were seeing great results. I have to say that their students were fantastic - so well behaved and interested. It was a joy to work with them. Ruth took Joan and I for a cup of coffee and I managed a quick last minute visit to some of the galleries. I had been for a look on Wednesday afternoon - and had fallen in love with many art works. My husband is an avid collector of Indigenous art and hence there's not much space on the walls at home. I had the pleasure of meeting Mary Pitjara when she was delivering some paintings to one of the galleries. I'm in love with her Bush Yams and am hoping she might deliver a slighter smaller picture soon - I think it could have my name on it. Our trip was over way too soon. Ruth drove us to the airport as Celia had left earlier in the morning enroute to Turkey! I was amazed that she'd had any time at all to drive me around during the week but she is a seasoned traveller and seemed completely unfazed. I hope she's having a terrific time on her tour. I haven't seen anywhere near as much of Alice Springs as I would have liked, so there's only one thing for it - I'll have to go again!